So, I reviewed the Saucony Kinvara here last month. My one complaint about that shoe is that because it’s so light for a neutral cushioning running shoe, it will wear out on you in 200-300 miles. This prompted me to wish that Saucony made a similar shoe–light and cushiony–that maybe a little extra cushioning and durability. And that’s when I was introduced to the Saucony Zealot ISO. I’d heard murmurs here and there about the Zealot, but after taking them for a test-run this week, I’m wondering why there isn’t a whole lot more buzz around this road-ready shoe. It’s just a few grams heavier than the Kinvara (Men’s Zealot: 8.3 ounces; Men’s Kinvara: 7.7 ounces), it’s got noticeably more cushioning, and the upper hugs your foot with plush padding. And like the Kinvara, it’s got a mere 4mm heel to toe drop, so it’s another ideal candidate for midfoot running. The first thing you’ll notice about the Zealot’s upper is it’s generous padding around the heel collar and tongue. Then, once you lace it up you’ll feel the ISOFIT membrane overlays snug up around your foot for a very secure fit. The great thing about ISOFIT is the material is elastic, so it stretches as your foot flexes with each stride. You’ll also appreciate the spacious toebox that’s seamfree to eliminate any funky skin rubbing. I keep stumbling when I say this shoe is both light and plush. It doesn’t seem like it should be possible for an 8-ounce shoe to feel this cushioned. But, it does. You might also notice the PWRGRID+ system in the midsole enhances the cushioned ride by distributing impact from each landing through a matrix of shock-absorbing fibers. Deep flex grooves make the Saucony Zealot very, very flexible so you’ll feel the shoe bend easily with your foot from landing to toe-off. In addition, Saucony added a pretty tough layer of XT-900 carbon rubber that’s grippy AND durable–much more so that the Kinvara. 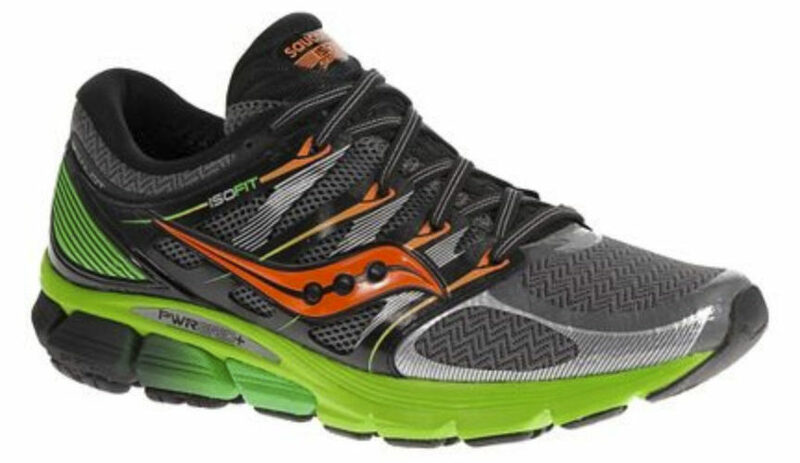 I gotta say that I’ve become a bigger fan of the Saucony Zealot than even the Kinvara. As much as I loved the Kinvara, you just can’t beat the amount cushioning and comfort you get out of the Zealot. Plus, you’ll find the Zealot just lasts a whole lot longer. So, if you’re looking for a light, flexible, but plushly cushioned neutral shoe, the Saucony Zealot is your new best friend. Next Next 26.BOO! Are Marathons No Longer Challenging?